Upon close inspection, I discovered that the grey EVA midsole were of different lengths in the right versus the left shoe. 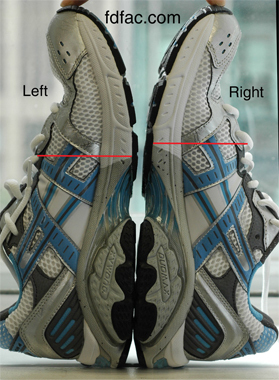 In this case the amount of EVA in the left shoe extends less forward than the EVA in the right shoe. This results in vastly different flex points in the forefoot as the grey EVA is much firmer than the white EVA as this image shows. As most of you know if you’ve read my blog, I am a huge fan of many Asics shoes, so I’m not being dispariging to their brand. This is simply a manufacturing error and one more instance where buyer needs to beware. Many patient’s I see have arch or heel pain, otherwise known as plantar fasciitis. 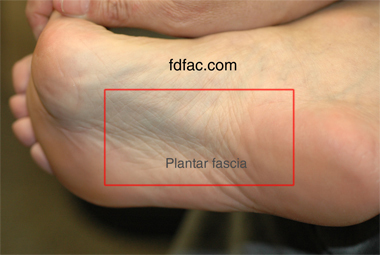 The plantar fascia is a structure on the bottom of the foot which extends from the heel to the ball of the foot. When it is tight (bow-strung) it can cause inflammation and pain. Not surprisingly, shoes can cause plantar fasciitis, especially shoes that are excessively worn, too short in the arch or too flexible. 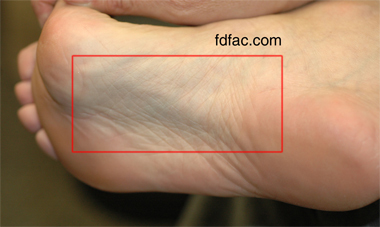 If you have plantar fasciitis you will definitely want to evaluate your shoes. You should also try not going barefoot in the house. If the pain persists, you will want to visit your podiatrist who may recommend calf stretches, anti-inflammatory medications (Motrin, Aleve) or give you a cortisone injection. Custom orthotics may also help. If you have morning pain, your podiatrist may want to fit you for a night splint which will keep your plantar fascia stretched out all night or show you how to tape if the pain persists. Although plantar fasciitis is a common condition, the longer you wait to seek treatment, the harder it will be to resolve.